Look what I bought today. 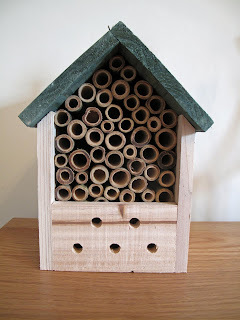 I had to do the food shopping today and was really pleased to spot this insect hotel in Morrisons. I've wanted one of these for ages, however was always put off by the silly prices. I had also thought about making one myself but was put off by my rubbish DIY skills and the virtually guaranteed trip to A&E. Anyway, now my insect hotel dreams have come true at the bargain price of just £3.00! Now it just needs installing on the shed wall. I'm looking forward to see if it gets any visitors. The weather today has been really quite horrible, however the forecast for the rest of the week is good (aside from the temperature). If the forecast allows I'm hoping to make it up to the allotment to finish some tidying up jobs and to make a start on sowing my broad beans, aubergines, and radishes. I can see a trip to Morrisons coming on, I love having little habitats for wildlife around the garden. I can't believe the prices I see things like this being sold for, they must think we've got more money than sense. I know. There is one for sale on Amazon for £50+! Admittedly, it looks much better than mine, with lots of different sized holes, etc...but £50?